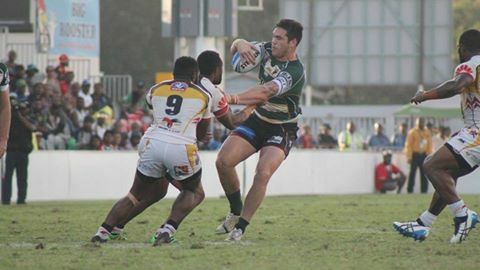 The PNG Hunters still remain unbeaten at home after defeating the defending premiers Ipswich Jets in an entertaining and tight affair in Port Moresby last night. In the end, a penalty goal from Hunters playmaker Ase Boas in the 77th minute proved to be the difference. Both sides played high-tempo football and started spreading the ball to the edges, however Ipswich were the first side to post points, thanks to a penalty goal from Haydan Lipp in the opening minutes. He slotted another penalty goal soon after, as the Hunters players were pinged for slowing the play-the-ball. Ipswich led the Hunters 4-0 with 20 minutes of the first half gone, but the home side fired back with winger Adex Wera scoring in the corner after a penalty from the visitors gave them enough possession. With the conversion attempt missed, scores were locked at 4-4. The short kick-off from the Jets gave them possession for an attacking set as they capitalised on the opportunity with forward Fakahoko Teutau running a great line to score. The home side were not yet done yet, and in-form fullback Bland Abavu made a great kick return and stepped past would-be tacklers before offloading to a flying Justin Olam who sprinted 40m to score. Another successful Jets short kick-off gave them possession and they again capitalised on the opportunity with Michael Purcell scoring from an offload. Lipp converted the try and the Jets were leading Hunters 14-8 head into the halftime break. Hunters were the first to score in the second half, when fullback Abavu side-stepped past defenders to score after penalty from the visitors gave them possession. Boas converted the try and both sides were locked at 14-14 with just five minutes gone in second half. The Jets were penalised 10m out from their own tryline for a ruck offence and the Hunters opted to take the two points with Boas calmly slotting the kick to give his side the lead. From there on, it was an arm wrestle as both sides tried their best to score points. With just 13 minutes remaining before fulltime, Watson Boas was penalised for delaying the tackle too long and the visitors opted for the two points with Lipp successful in his attempt. With scores again locked (16-16) in the final 10 minutes of the game, the home crowd was as usual right behind their team. The Jets were given the opportunity to take the lead after the Hunters were again penalised; this time for being offside, just 30m from the Hunters try line – but they opted otherwise and ran the ball. Some solid defense forced error from the Jets and with just three minutes to go before fulltime, the Jets were once more penalised for taking too long in the ruck area and the Hunters chose to kick for two points. Boas had missed a couple of previous attempts at goal, but slotted it over when it mattered, with his third kick of the game bringing the vocal crowd into eruption as they celebrated the 18-16 win over the Ipswich Jets. PNG HUNTERS 18 (Adex Wera, Justin Olam, Bland Abavu tries; Ase Boas 3 goals) def IPSWICH JETS 16 (Fakahoko Teutau, Michael Purcell tries; Haydan Lipp 4 goals) at National Football Stadium, Port Moresby.